Flowers: Pale yellow, clustered on long plumes, fragrant. Fruit: Round, 3/4" - 11/8" in diameter, yellow, maturing to black. The thin sweet flesh, with a date-like or caramel taste, can be eaten fresh. Leaves: A green, wide fan shape with a center rib, dividing past the half-way point into many long fingers. Stems: The trunk grows to a 1.5' diameter. The leaf stalks have small or non-existent spines. Wildlife: Attracts insects and birds. Toxic / Danger: No. Possible small spines on leaf stalks. USDA hardiness zones: 9-11. Hardy to 18°F. Sun: Full sun. Intolerant of heavy shade. Water after becoming established: Water deeply once or twice month, especially for temperatures over 90°F. Soil: Very well drained, tolerant of soil types otherwise, ph 6.1-9.0 (slightly acidic to highly alkaline). Salt tolerant. Fertilize: A magnesium (Mg) deficiency might occur in highly alkaline soil. Prune: Dead fronds tend to drop off on their own. Litter: Low, except infrequent frond and yearly wet fruit drop. Propagation: Seed, which takes 2-4 months to germinate. Uses: Ornamental, xeric garden, edible fruit. Part of the Palm family (Arecaceae), the Brahea genus has eleven species, all with fan-shaped leaves, including the Mexican Blue Palm. Brahea edulis has the largest fruit in its genus. 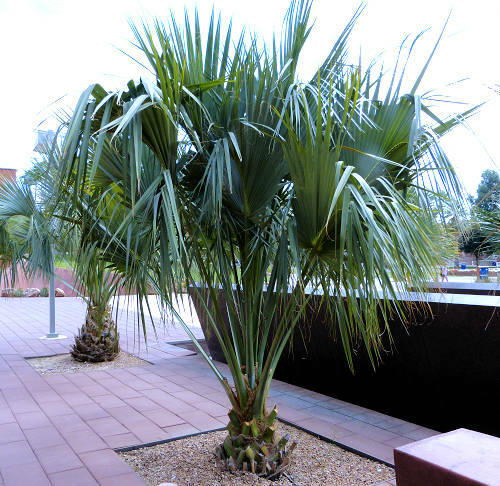 It does better in hot, dry climates with low humidity, and withstands windy locations.